The best way to become a sports car manufacturer? Pick an existing chassis of your liking, invest in some tuning and apply a new body design. A simple recipe that many tuners from the past have used before. Often with great success, like for instance Alpine (Renault), Abarth and Moretti (Fiat), Lister (Jaguar) and more recent Guldstrand, Callaway and Anteros (all three on Corvette) and Saleen (Ford). 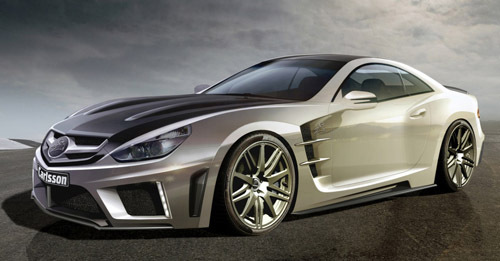 German Mercedes Tuner Carlsson now performs the same trick by presenting the C25, a tuned and rebodied Mercedes SL600. Carlsson's C25 is designed by a guy named Rolf Schepp, who took the underpinnings of the Mercedes SL600 and applied a new set of lines over its hard points, while replacing the folding hard top with a fixed coupe roof. The tuning engineers at Carlssons knew just what to do with the technique. The result: a dramatically styled sports car with lots of cooling vents, a very agressive front end, muscular fender lines, fitted with a tuned twin-turbocharged V12 engine, generating 753 hp (562 kW) and 1150 Nm of torque. Estimated acceleration from 0-100 km/h (62 mph) in 3.7 seconds and the expected top speed is 219 mph. Impressive! The C25 will be produced in a limited run of 25 units (hence the name C25) and Carlsson will only deliver one automobile per country to ensure exclusivity. 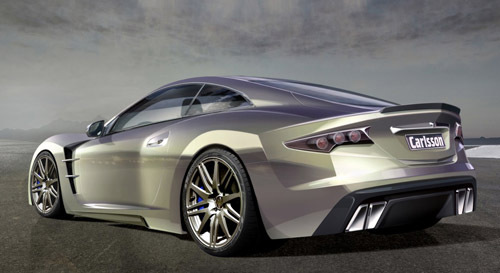 The car is destined to make its public appearance at the 2010 Geneva Motor Show, next March. We're looking forward to it. So far the C25 looks very good, especially in the blue colored side view, and the new body still displays plenty of recognizable Mercedes DNA, which is good. However, the photoshop renderings can be deceiving. The car is not finished yet and the colored pictures you see here are only 2D renderings. It is to be expected that the actual car will have a lot less expressive appearance. Just have a look at the full scale clay model below, compare it with the photoshop renderings above and see for yourself. We keep our fingers crossed for the Geneva introduction. Carlsson's customers don't seem to mind, though, because it is said that all 25 units are already sold out for a price unknown to us. 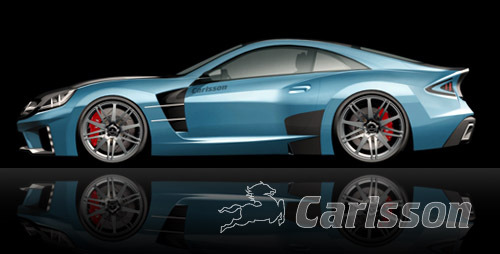 Click here for the Carlsson C25 Gallery. More images will be added after the introduction of the actual car in Geneva, next March.